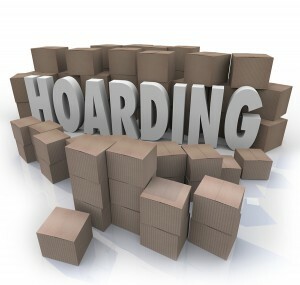 Hoarding affects all types of people, young, old, male and female. 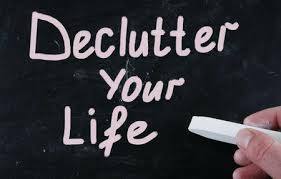 The type of hoarding or clutter that is found within a household often times reflect the interests, hobbies or career of the individual. Either way, the fact of the matter is that the hoarding is affecting the individual’s life, and those surrounding them as well. In the end, the hoarder’s lifestyle may be dramatically altered, ranging from a limited social life to being cut off from family and friends as a direct or indirect result of hoarding. This ultimately leads to the hoarder becoming more and more attached to the clutter that surrounds them, relying on their “stuff” for social interaction and comfort. 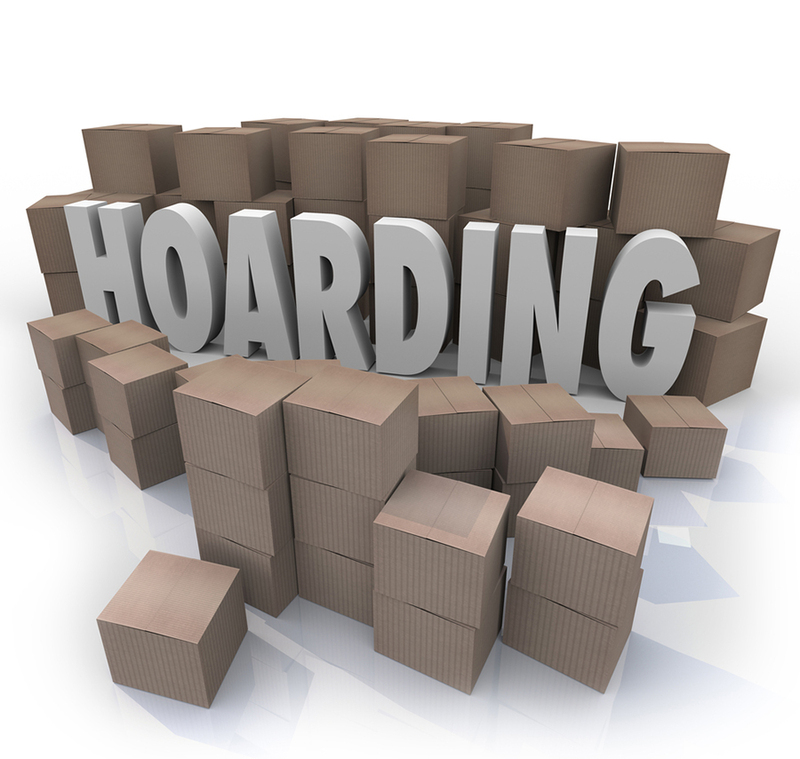 In our experience, we have found that the most common cases of hoarding exist within certain trends or labels. Listed below are the most common hoarding cases that we have worked with through our 21 years of experience. A person that acquires more animals than they can properly care for is classified as an animal hoarder. The reality is, animal hoarders typically begin their accumulation with the best intentions-whether saving animals, providing shelter, adoption, or one of the many other reasons for animal hoarding-their pure intentions soon fade into the background as the inability to properly care for the growing number of animals becomes more evident. As the accumulation of animals grows, either through the steady acquiring of more animals or through the animals producing litters of their own, the situation can quickly spiral out of control. The loss of control often results in the animals often becoming sick or worse, dying. More often than not, we encounter animal hoarder’s homes that are also affected with the general accumulation of clutter. These homes can present extremely dangerous conditions due to the safety issues contributed to the clutter in addition to the animal waste issues that are present within the home. 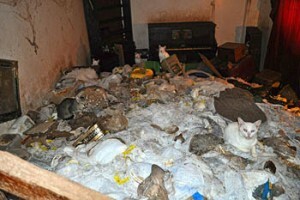 These homes need to be addressed by professionals that specialize in animal hoarding and hoarding scenarios before the home is safe for re-occupancy. Select Restoration, Inc. offers a cleanup program that is dedicated and specific to your particular needs, while providing the remediation services needed in these scenarios to restore the home to a safe, clean, and functional living environment. Also referred to as an information hoarder or a knowledge hoarder, this category of hoarding typically involves individuals with an extremely high intelligence. These hoarders may hold careers that require a large amount of research or the obtaining of career related materials (i.e. teachers, engineers, scientists, accountants, lawyers, etc.). 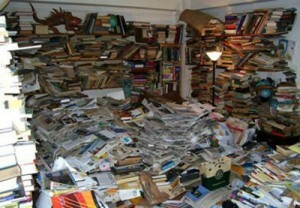 The information hoarder justifies the accumulation of clutter through their never-ending quest for knowledge. We have seen information hoarding cases vary in degree and type, from a home that contained tens of thousands of books, to a home where the homeowner, a retired CPA, had rooms overflowing with work files, financial paperwork, and career related materials that dated 40 plus years old. In all of these cases, the collection of information is vital to the day-to-day process of the hoarder, no matter how unlikely the use is for all of this information. It is as if letting go of the books, magazines, and information that has accumulated to overwhelming levels will be like letting go of a part of themselves. Syllogomania is defined as the hoarding of pure trash. Although pure syllogomania hoarding cases – where there are no items of value, sentiment, or functional use – are rarely seen, they do exist. When we encounter these types of hoarding cases, generally the overall conditions of the home are despondent. Extremes have usually been met, such as utilities being completely shut off, and the home being contaminated with a combination of insects, rodents, and gross filth conditions. 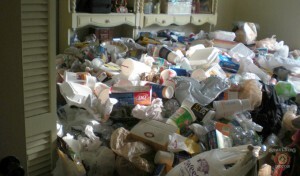 These individuals in general tend to have more severe symptoms of mental disorder than the average hoarder. These symptoms require specialized treatment from not only a mental health standpoint, but also in addressing the conditions of the home. Only a company that values the human element like Select Restoration, Inc. can be trusted to compassionately tend to the remediation needs of these individuals. Larder hoarding, or more commonly known as food hoarding, is mainly contributed to the fear of losing everything. This fear drives the individual to stockpile items that may assist in a perceived “survival mode,” where they are forced to live off of their stockpile. Although everyone should have some kind of reserve in case of emergency situations, such as a natural disaster or losing a job, these individuals take this ideal to an extreme by turning their home into a storage unit for their excessive stockpile of food and other items. The large majority of the items in these scenarios go remain untouched and unused. Food hoarders are difficult to reason with, taking as example the fact that many of them do not see any validity behind expiration dates for food items. A recycler is usually a hoarder that has large piles of plastics, glass, and aluminum cans throughout their home that far exceeds the normal amount that an average household may contain. These individuals will retain the intention in their minds that they will recycle all of the contents of their home which will bring them large amounts of cash. 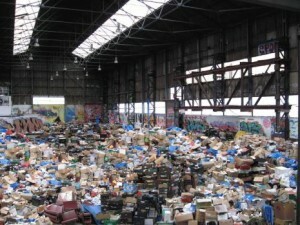 However, the piles continue to increase in size and scope to the point where entire rooms are filled with potential cash as the intention of recycling never materializes. Additionally, the amount of recyclables that fill the home becomes so extensive that it would literally take dozens upon dozens of trips to the recycling center to remove all of the items for recycling. 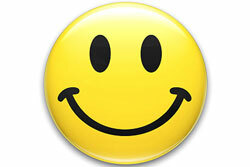 Steri-Clean, Inc. has worked with numerous clients that have needed our help in recycling. In these cases, we will transport all recyclables to a local recycling center for the homeowner and provide the cash and receipts as requested. Also, our vehicles are large enough so that we can cut the dozens of trips to the recycling center down to a handful, and ultimately fulfill that original intention of recycling that the homeowner had. 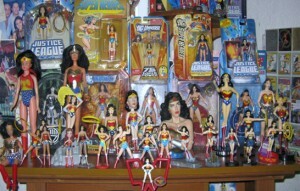 Collectors typically start off collecting a certain category or group of items. In almost all of these cases though, eventually the collection grows to a point that exceeds the control of the individual or the collector sparks a new interest in a new collection of items. The collection ultimately grows to a size where it is considered hoarding due to the fact that the collection is interfering with the daily functioning of the household. Although the collector may not have been considered a hoarder upon starting the collection, a slippery slope evolves from the situation due to items being used for the day-to-day functioning of the home are either lost or inaccessible due to the collection taking over the home. This almost always leads to the accumulation of every day clutter on top of the already large collections within the home.